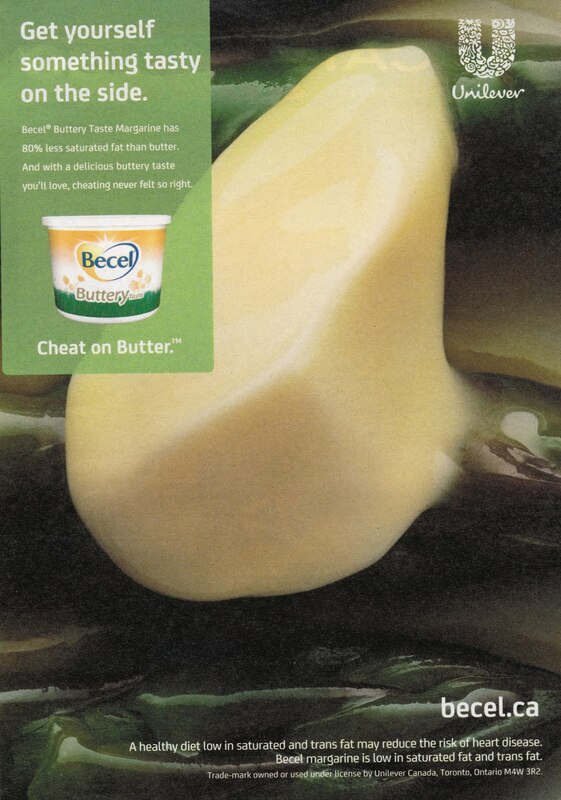 Weighty Matters: Badvertising: For God's Sake, Just Frickin' Eat Butter! Yet another example of why national Food Guides matter. "having 80% less saturated fat than butter and with a delicious buttery taste"
"A healthy diet low in saturated and trans fat may reduce the risk of heart disease"
Yet saturated fat has been exonerated as being an independent risk factor of disease....probably something worth telling the general public, but of course Health Canada can't possibly respond to a changing evidence base by actually changing recommendations. I mean come on, that would mean changing the Food Guide more frequently than every 10-15 years. That's just crazy talk. "Canola and sunflower oils 74%, water, modified palm and palm kernel oils 6%, salt 1.5%, buttermilk powder 1%, soy lecithin 0.2%, natural & artificial flavor, potassium sorbate, vegetable monoglycerides, citric acid, alpha-tocopherol acetate, calcium disodium EDTA, vitamin A palmitate, beta-carotene, vitamin D3."